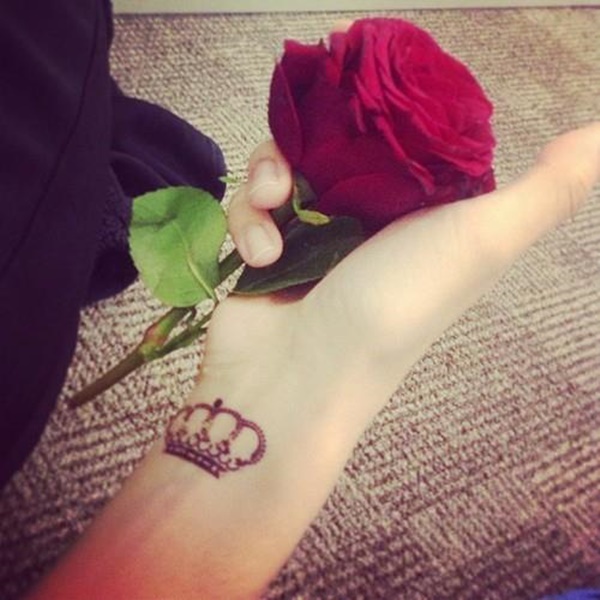 Few symbols are so synonymous with royalty as the crown. Because the item is specifically meant to be worn by the highest members of the ruling family, crowns are often used in marketing and art to add a sense of class to products in images. 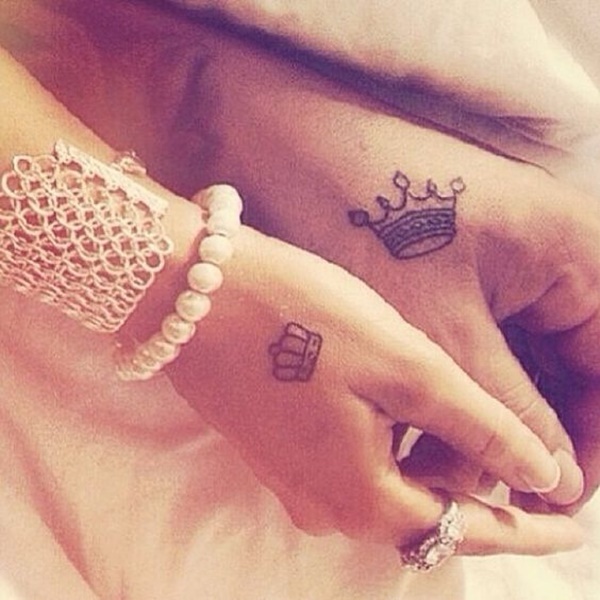 In this article we will see 101 crown designs that can turn any pauper into a prince. 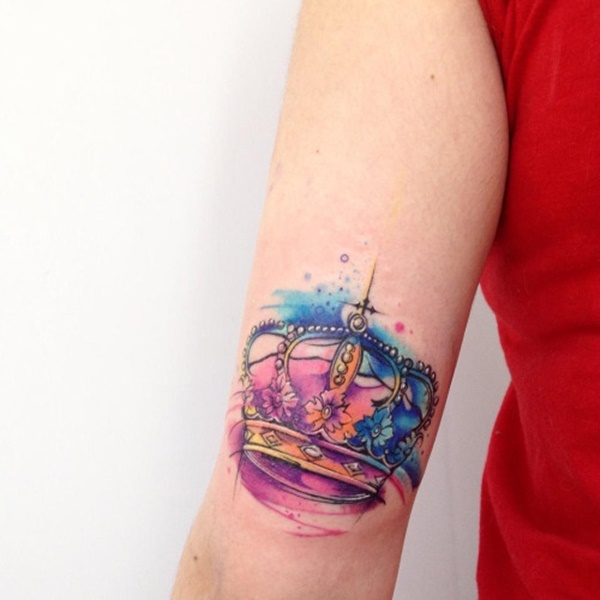 A crown is colored with blue and purple watercolor smears on the wearer’s upper arm. 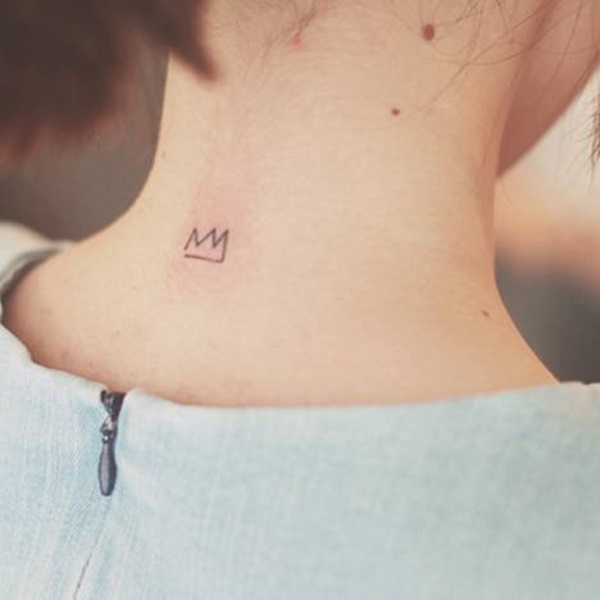 A simplistic crown outline is rendered in black ink on the back of the wearer’s neck. 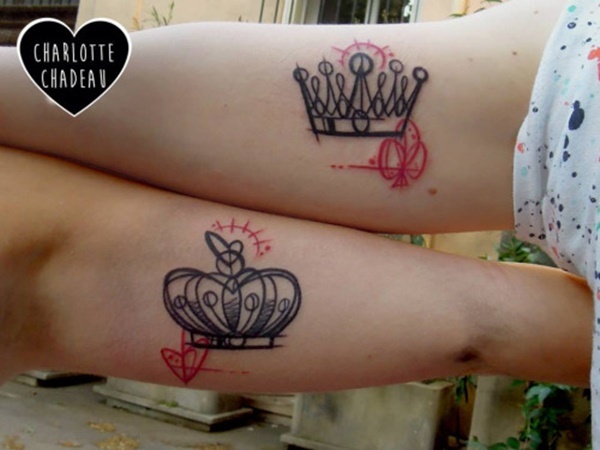 A stylized pair of king and queen crowns are portrayed on the wearers’ arms in this tattoo set. Bold black outlines are used to create the outline of a crown. 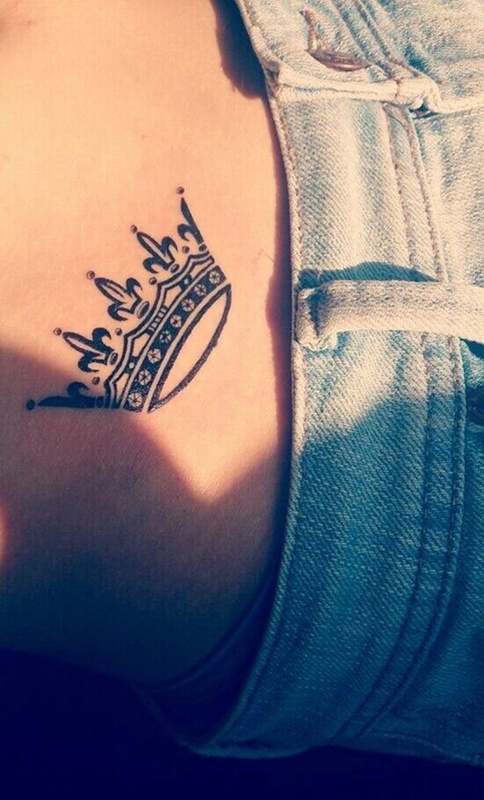 A crown is rendered in black ink on the wearer’s wrist in this tattoo. 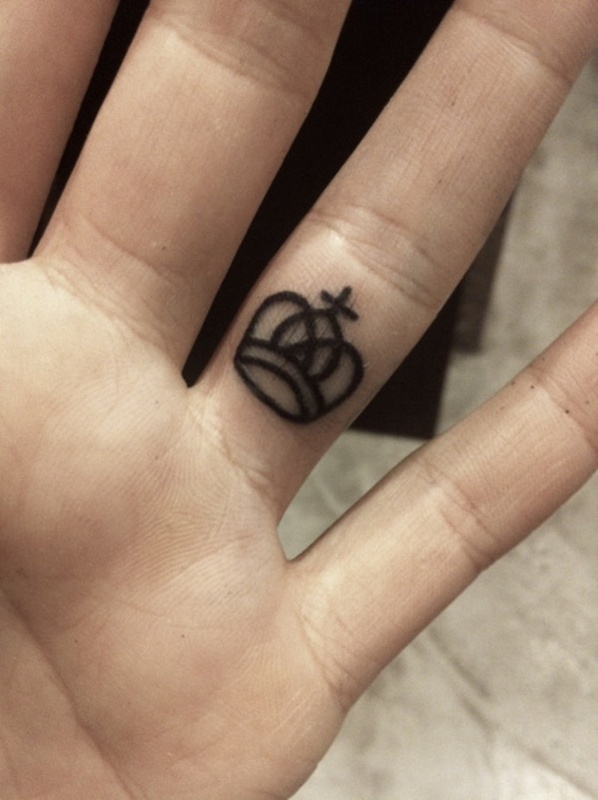 A simple black outline is used to illustrate a crown on the wearer’s ring finger. 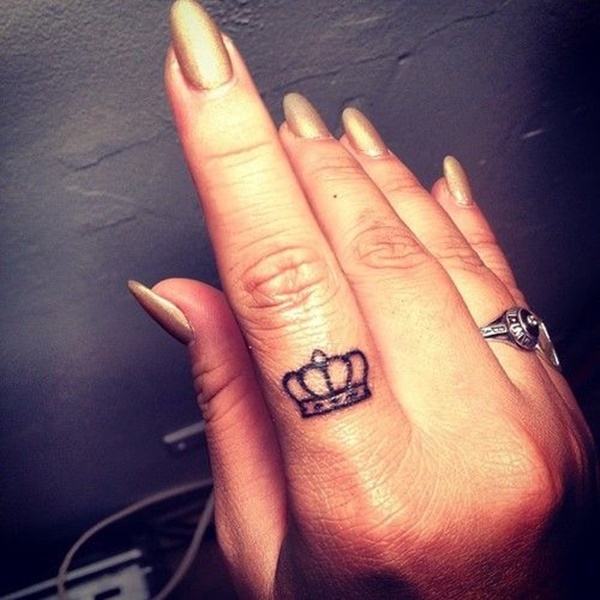 A cluttered crown illustration is depicted on the wearer’s middle finger in black ink. 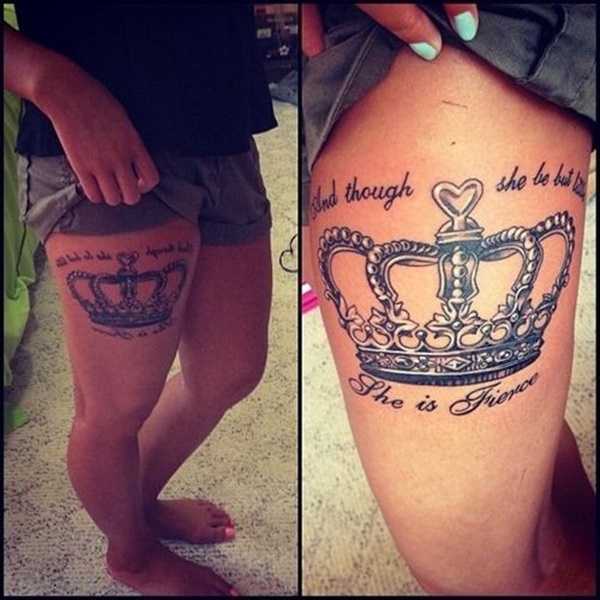 An ornate black and gray crown is illustrated on the right side of the wearer’s hip in this tattoo. 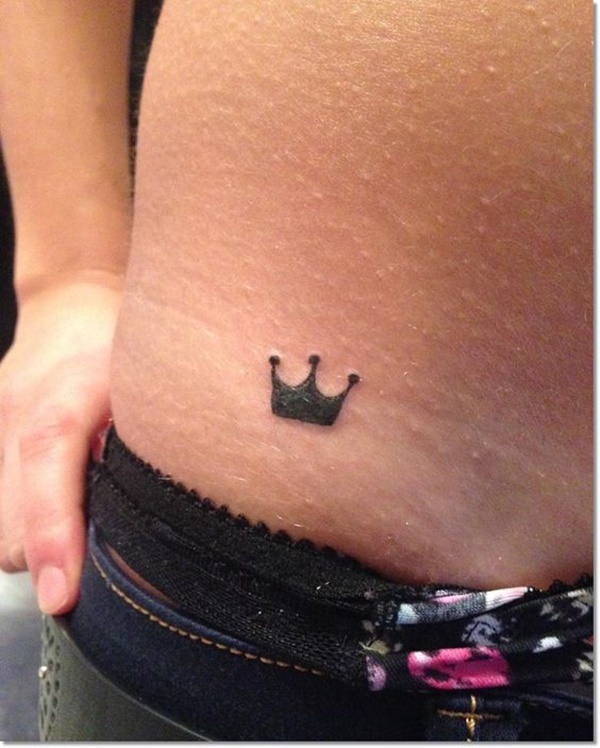 A simplistic black crown is illustrated on the underside of the wearer’s ring finger in this tattoo. 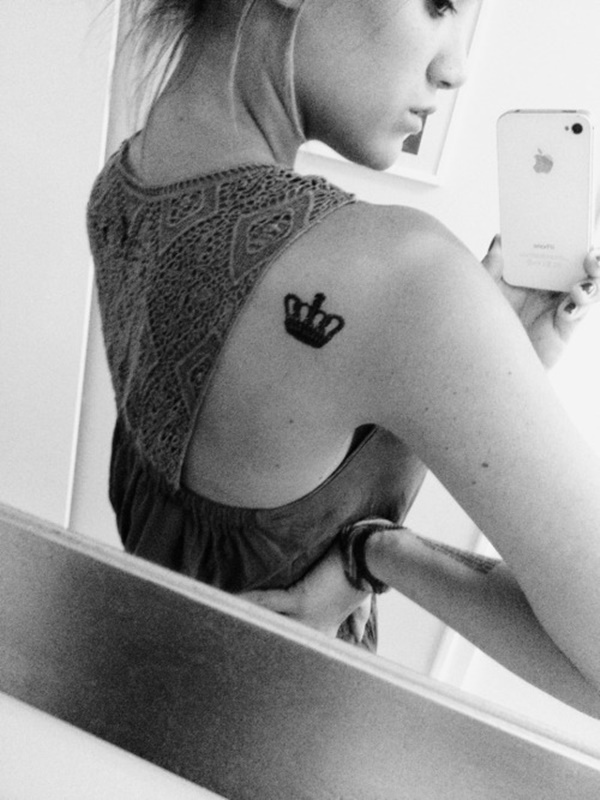 A minimalist black depiction of a crown is portrayed on the wearer’s right shoulder blade in this photo. 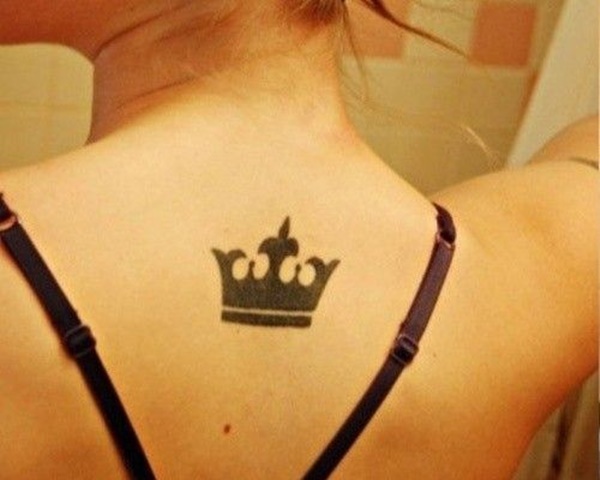 A crown is illustrated between the wearer’s shoulder blades in black, gray, and white ink in this tattoo. 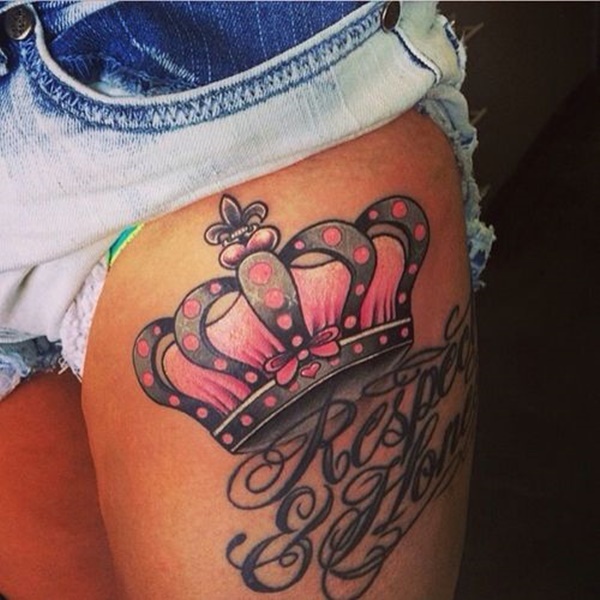 A black crown is depicted on the wearer’s thigh in this tattoo. 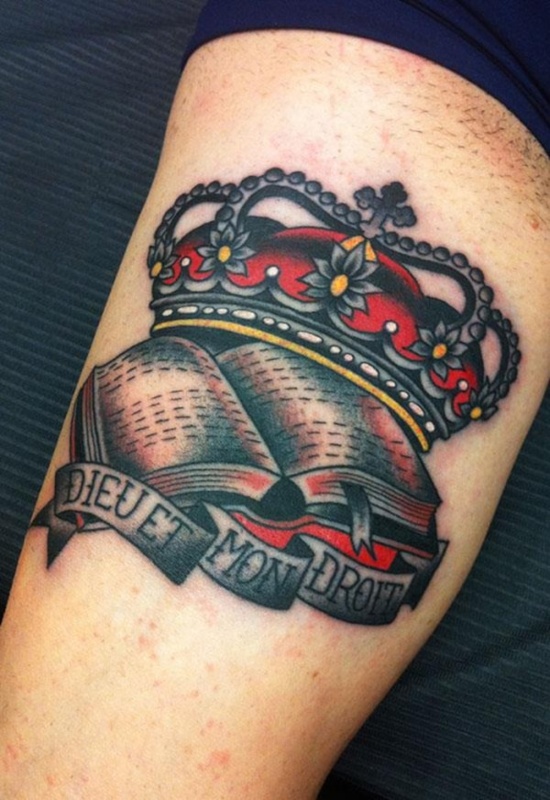 A crown sits atop a book while a banner reading, “Dieu et mon droit,” the motto of the British Monarch meaning, “God and my right,” sits at the base of the image. 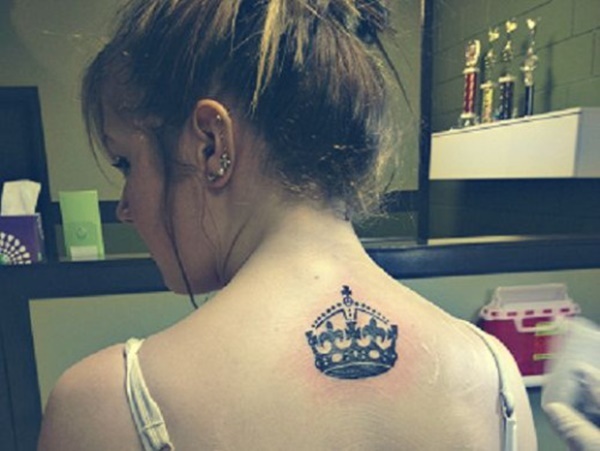 A crown accented with Fleur de lis embellishments is seen between the wearer’s shoulder blades in this tattoo. 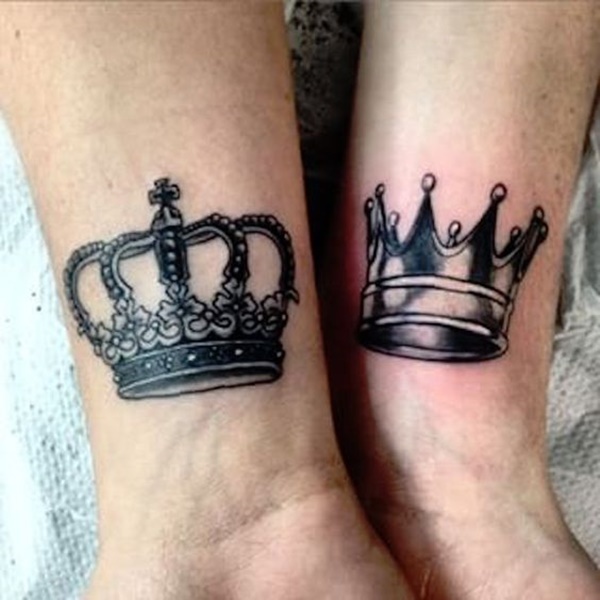 A set of king and queen crowns are seen the on the wearers’ forearms in this black and gray tattoo set. 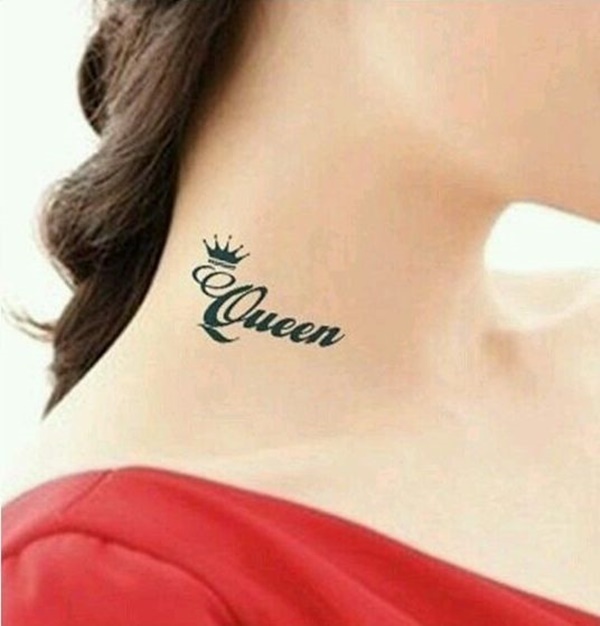 The word, “Queen,” is inked onto the wearer’s neck with a crown resting atop the Q of the word. 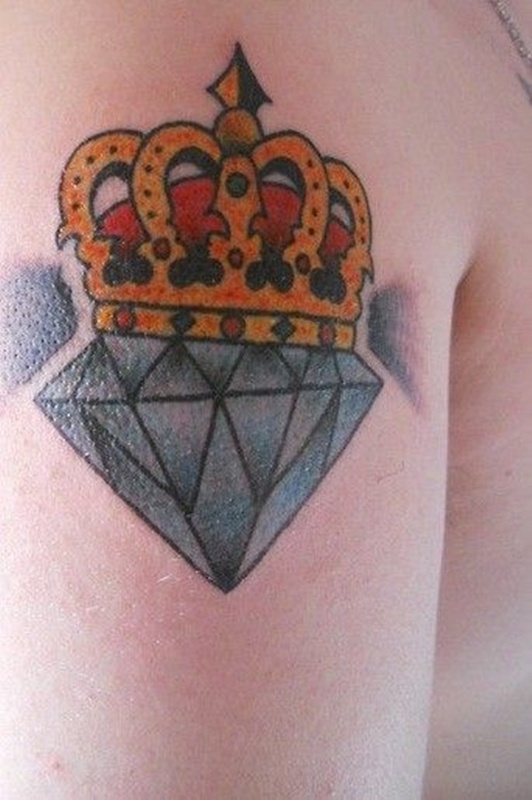 A blue diamond has a red and yellow crown resting atop itself in this tattoo. 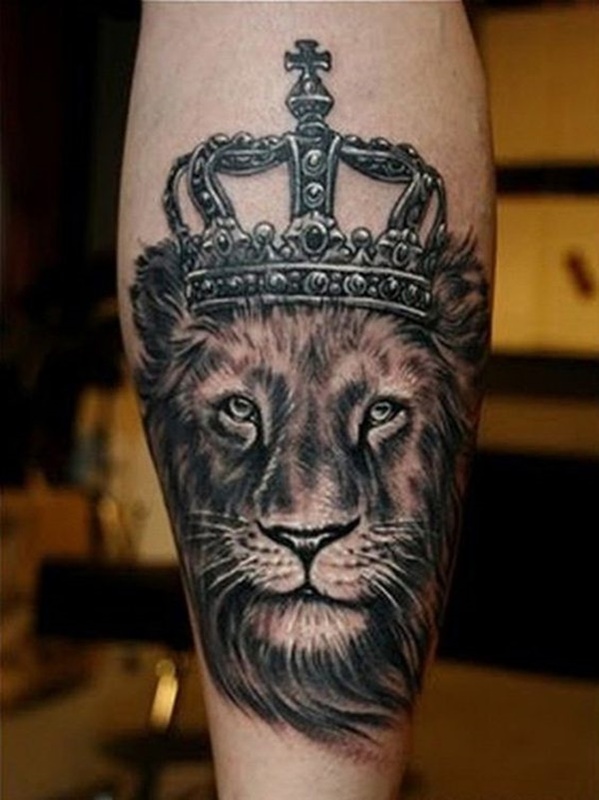 A black and gray lion is portrayed with a crown atop its head in this tattoo that utilizes white ink to accent the piece. 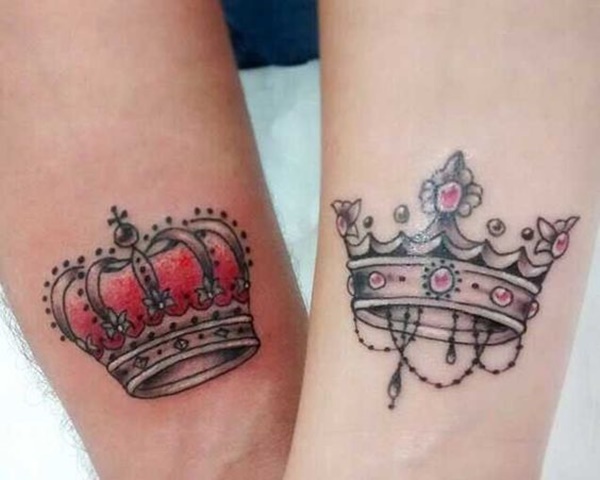 Red, yellow, black, and white crowns adorn the wearers’ wrists in this tattoo set. 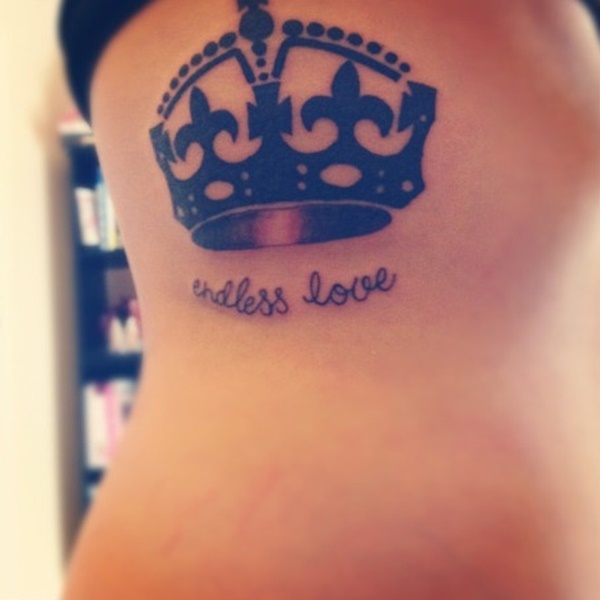 A black crown void of shading adorns the wearer’s forearm above the letter V in this tattoo. 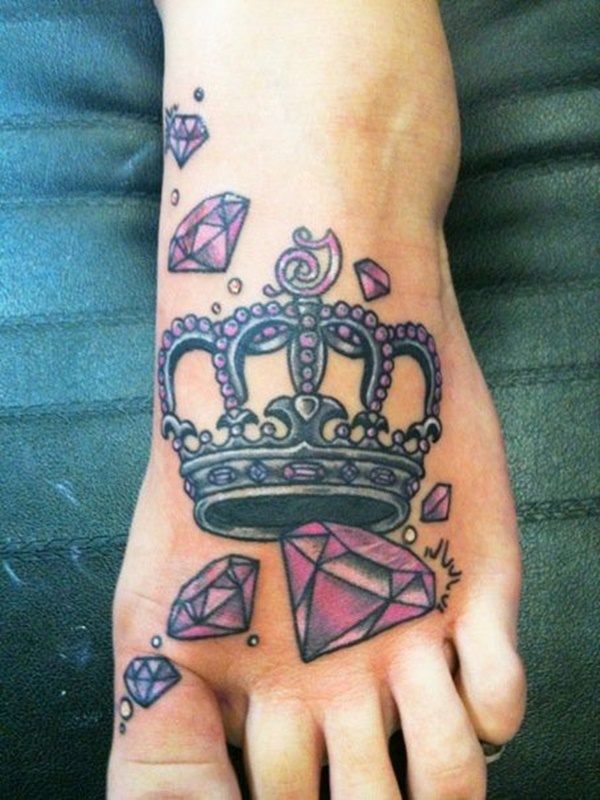 A hyper-detailed black and gray crown is portrayed on the topside of the wearer’s left foot in this tattoo. A black and gray crown is depicted on the wearer’s wrist in this piece. 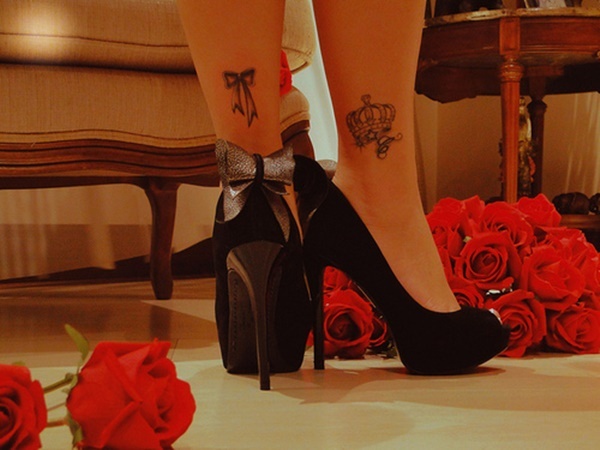 A detailed black and gray crown sits above the wearer’s right ankle bone in this tattoo. 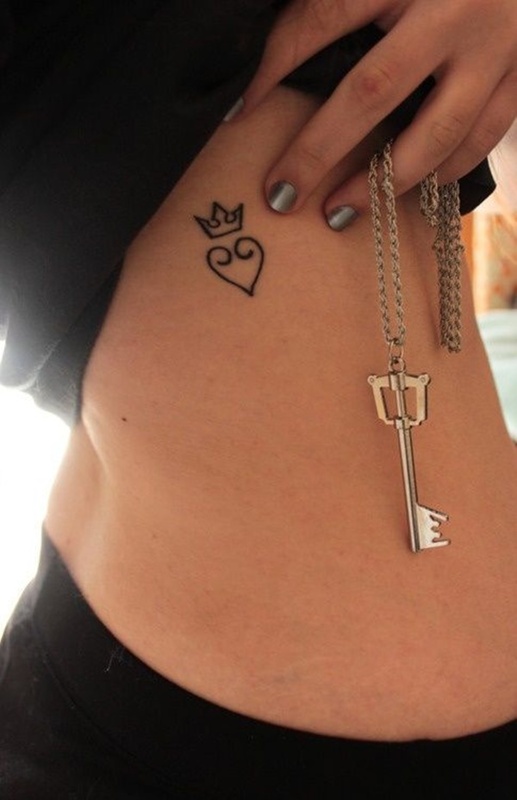 A stylized black crown with fleur de lis embellishments is illustrated on the wearer’s right hip. 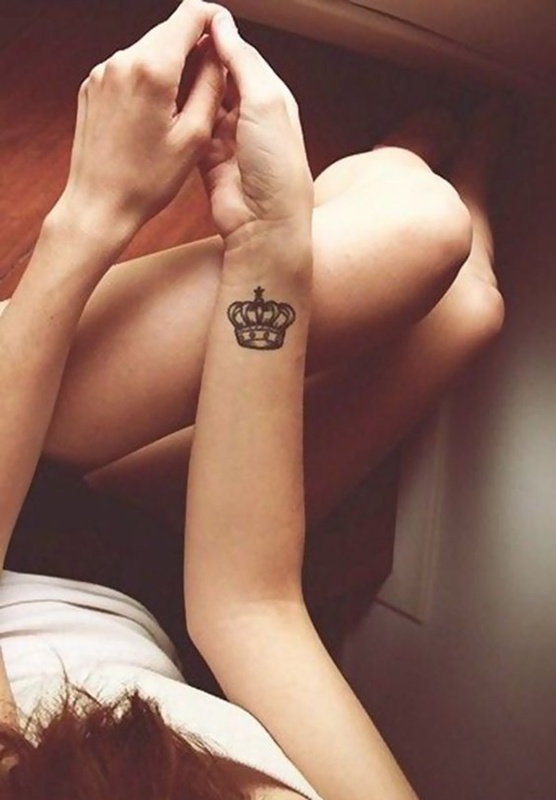 A simplified depiction of a crown is rendered in black ink on the wearer’s wrist in this tattoo. 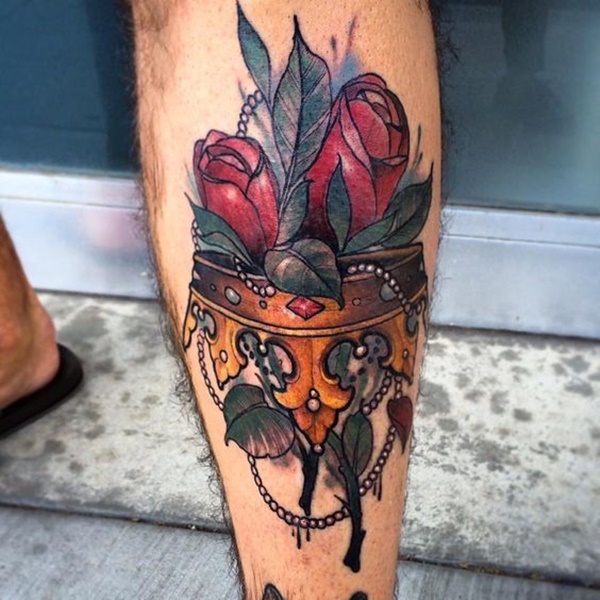 A red rose is topped with an audaciously bright crown colored yellow with and embedded with purple gemstones. 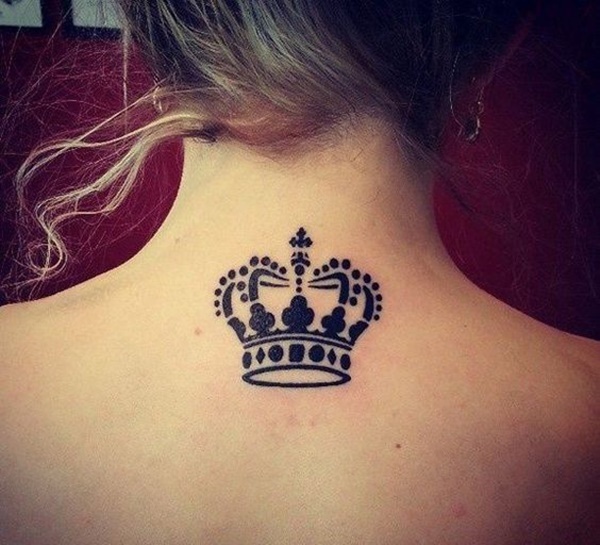 A crown spans the width of the male wearer’s upper back while the female wearer’s piece sits between her shoulder blades in this black and gray tattoo set. 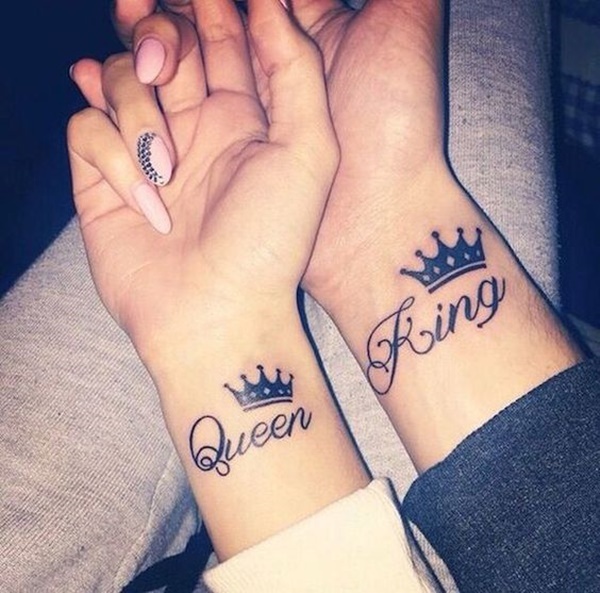 A simplified pair of king and queen crowns are rendered on the wearers’ wrists in black ink. 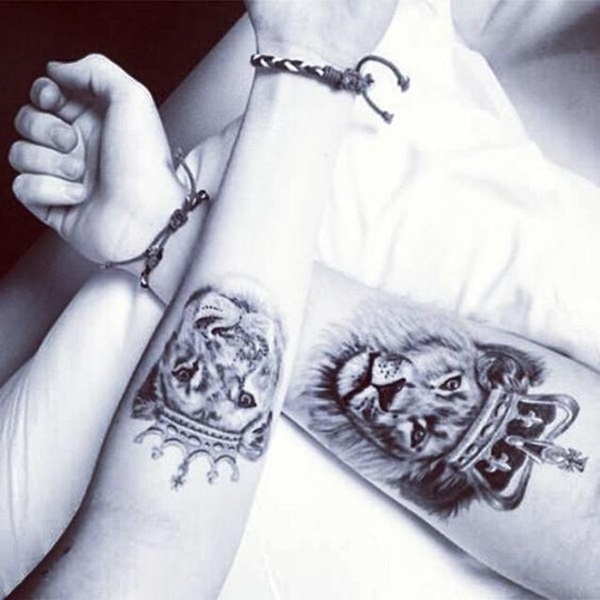 This black and gray tattoo set renders a lion wearing a crown on the male wearer’s forearm and a lioness wearing a crown on the female wearer’s forearm. 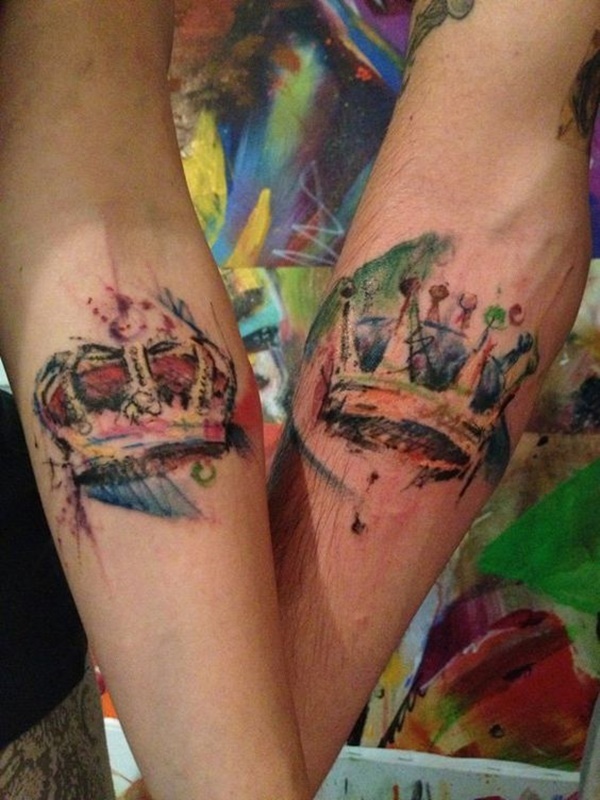 A pair of abstract crowns are portrayed on the wearers’ forearms in this tattoo set. The intentionally imprecise line work is accented with splashes of color that create a pair of intriguing images. 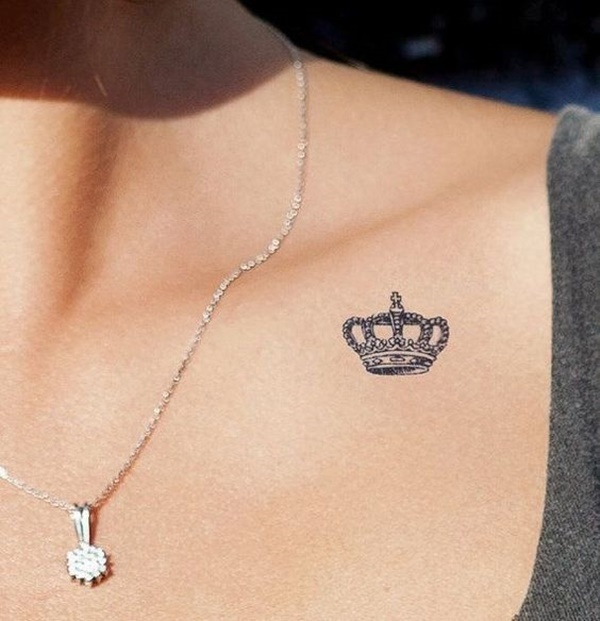 A black crown with fleur de lis embellishments is inked onto the wearer’s right collarbone. 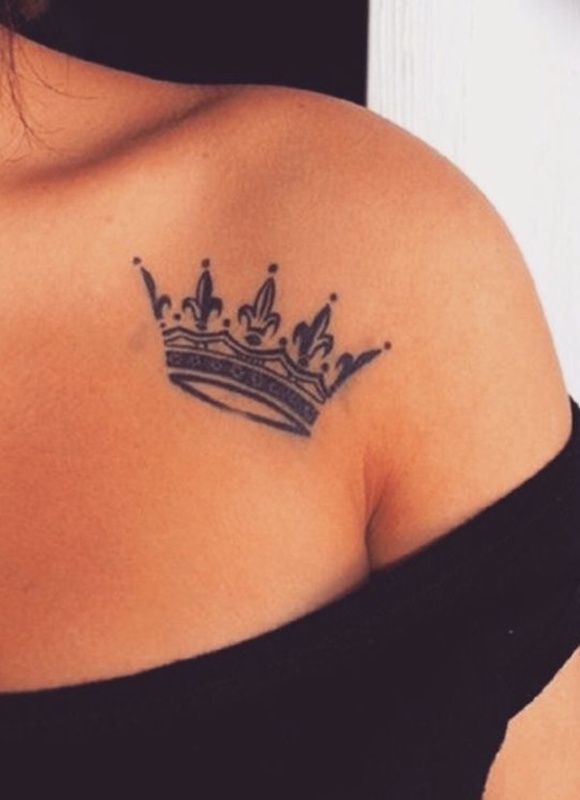 A small black and gray crown is inked near the wearer’s left collarbone. An upside down crown is embellished with pearls and portrayed with roses through the band. 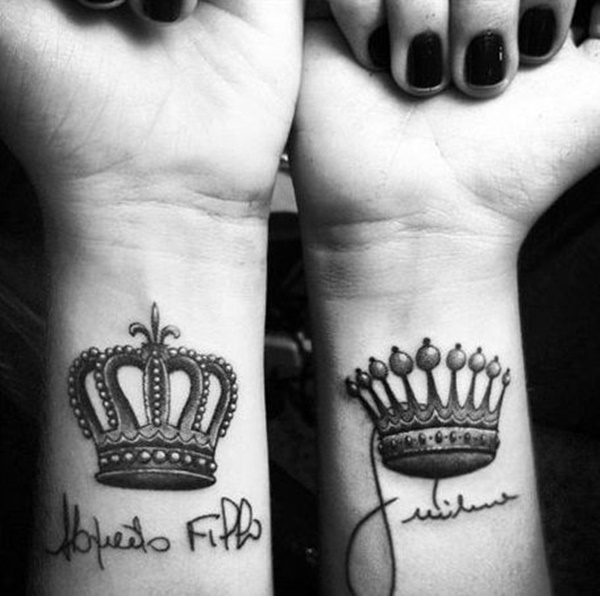 A pair of black and gray crowns are rendered on the wearers’ wrists and accompanied by the wearers’ signatures in this tattoo set. 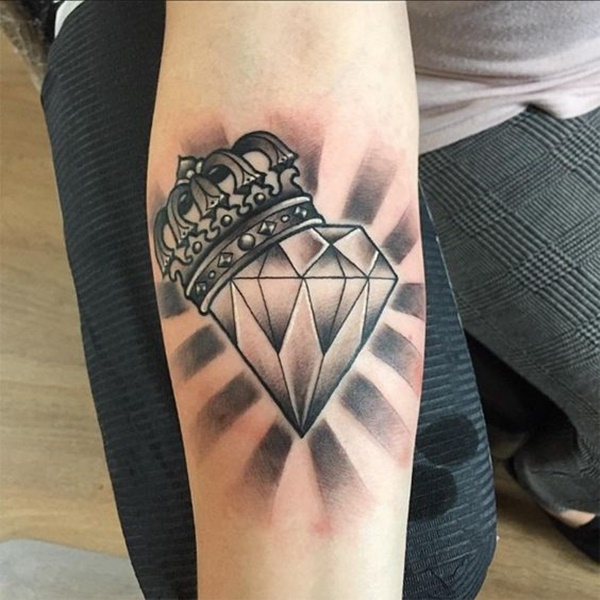 This black and gray tattoo portrays a shining diamond with a crown sitting atop the upper left portion of the jewel. 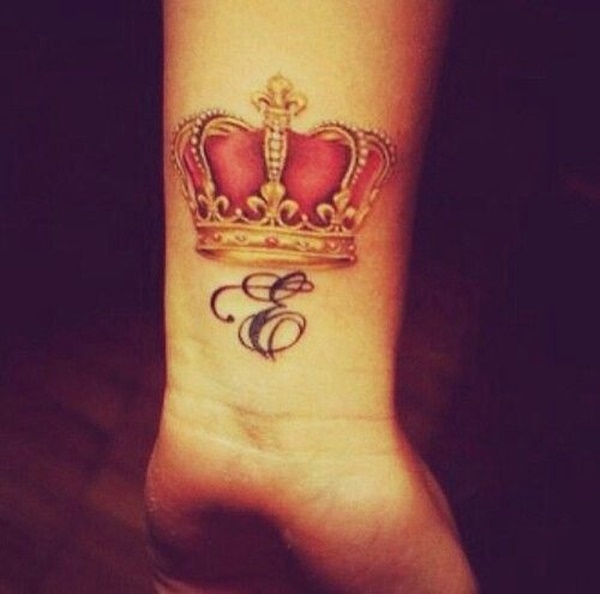 A red and gold crown is depicted on the wearer’s wrist above the letter E in this wrist tattoo. 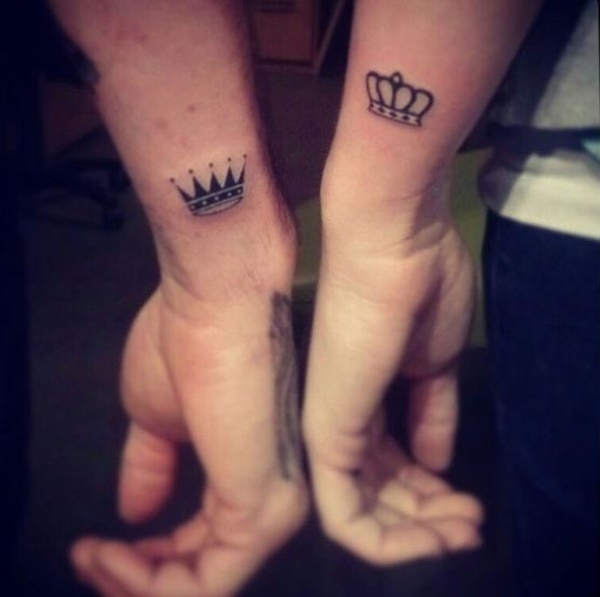 Simplistic renderings of a king and queen crowns are depicted on the wearers’ hands in black outlines in this tattoo set. 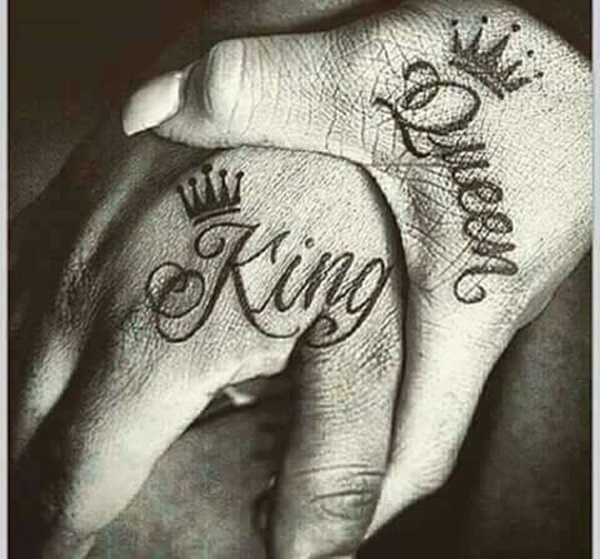 The word, “King,” is inked onto the male wearer’s hand with a crown atop the K, while the word, “Queen,” is inked onto the female wearer’s hand with a crown atop the Q in this tattoo set. 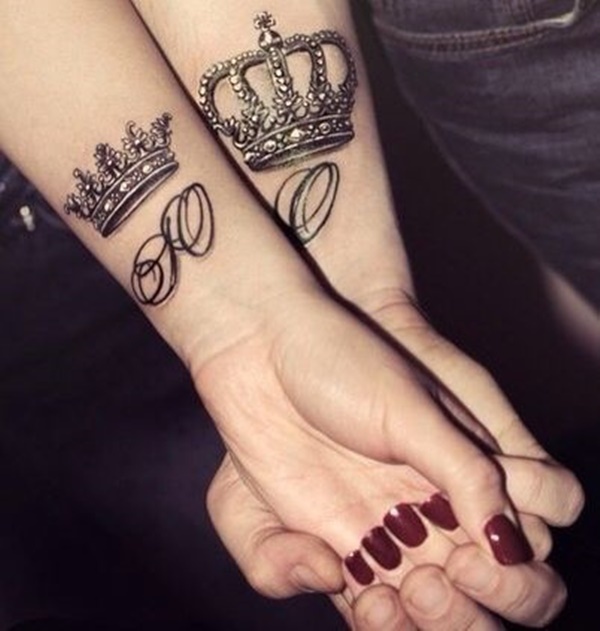 Simplistic renderings of a king and queen crown are illustrated in black ink on the wearers’ wrists. A light gray crown is embellished with a blue diamond and purple ribbon. 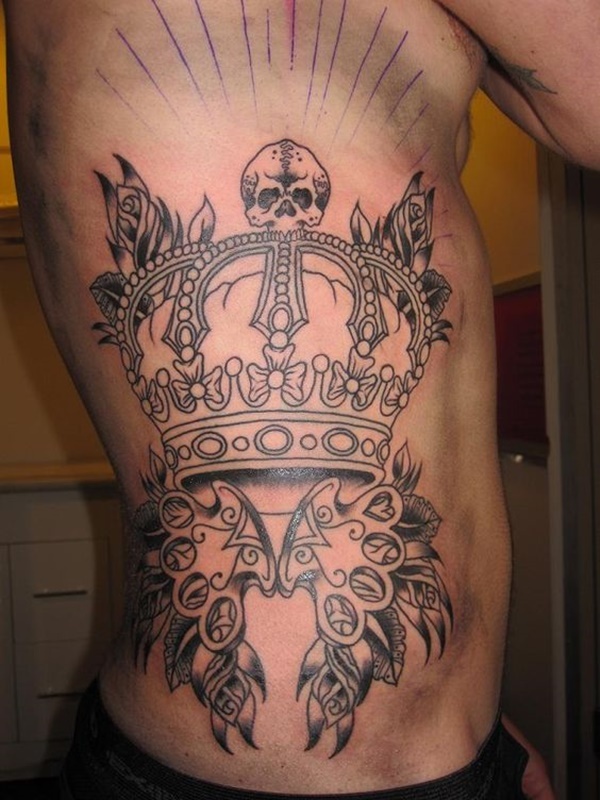 A crown is embellished with a crown and a pair of brass knuckles in this black and gray tattoo rendered on the wearer’s torso. 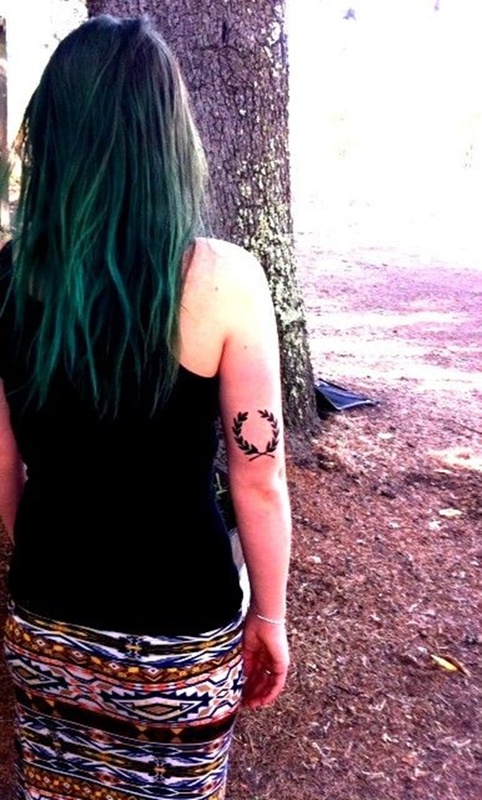 A wreath, which was used as a crown for the Emperor of Rome, is inked onto the back of the wearer’s upper right arm. 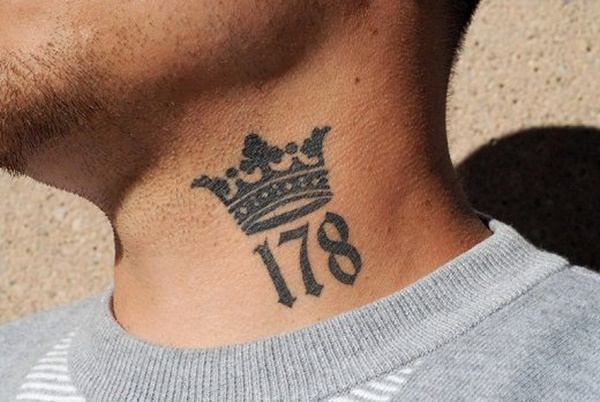 This black tattoo, portrayed on the wearer’s neck, shows a simple crown above the number 178. 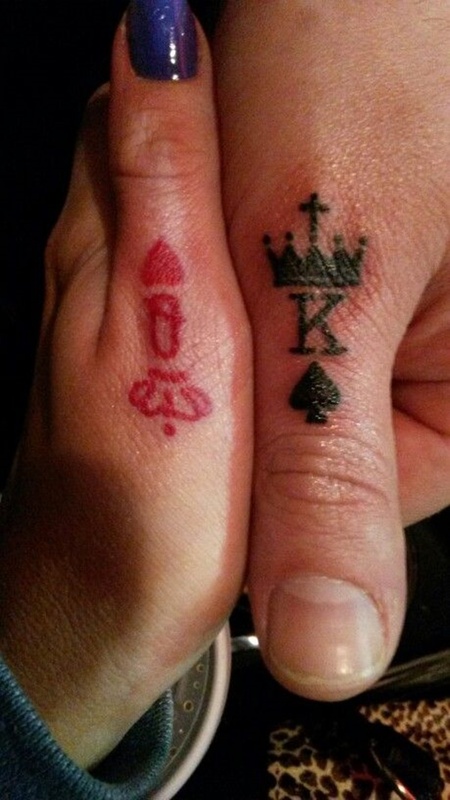 The symbol for the king of spades is topped with a crown on the male wearer’s thumb while the symbol for the queen of hearts is topped with a crown on the female wearer’s thumb. 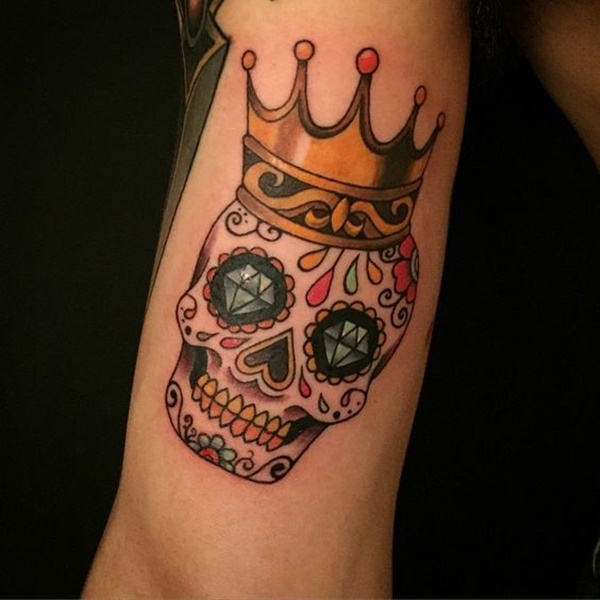 A skull embellished with colorful designs and diamond in its eyes has a golden crown resting atop its head. 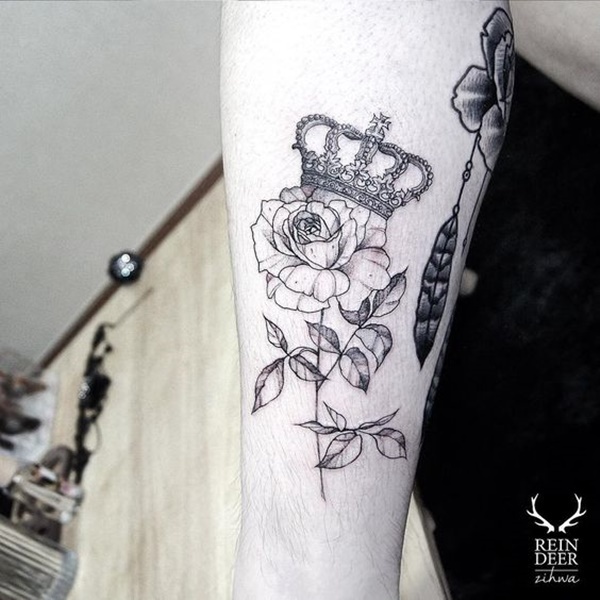 A black and gray rose is topped with a crown in this forearm tattoo. 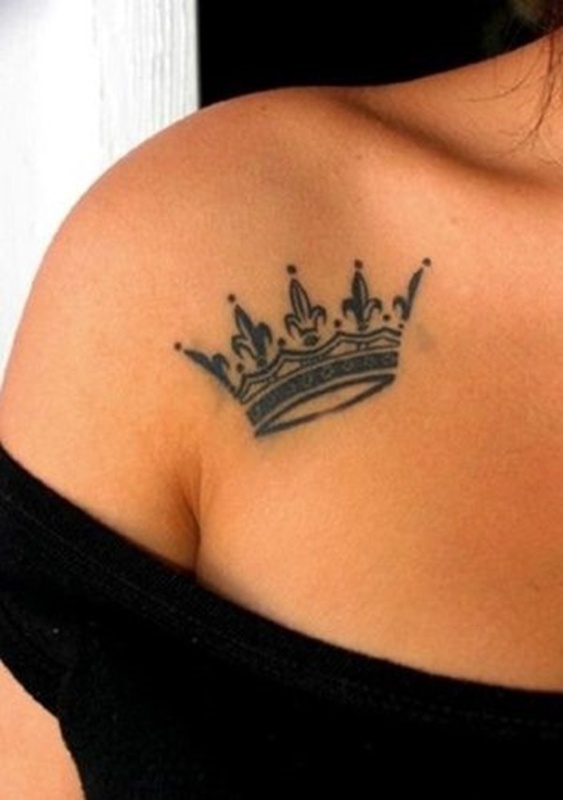 This black, gray, and white crown tattoo is located between the wearer’s shoulder blades. 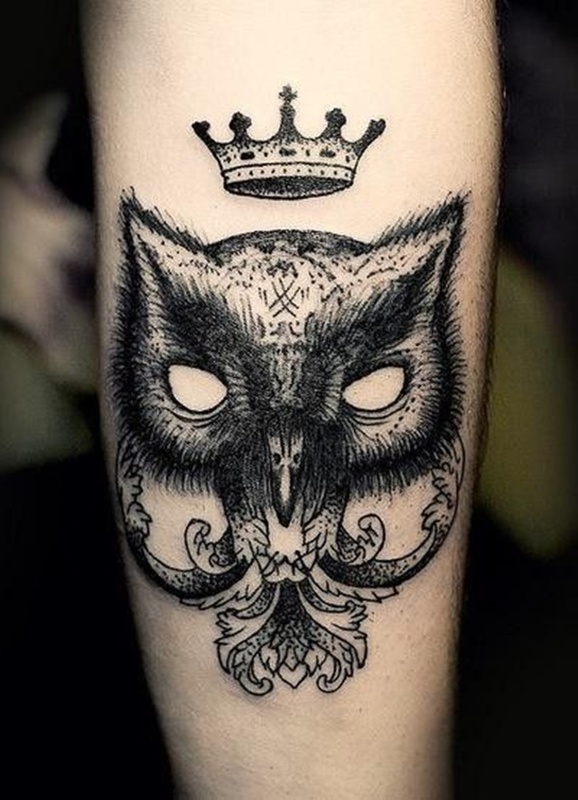 A hyper-detailed black and gray crown is illustrated on the wearer’s bicep in this tattoo. 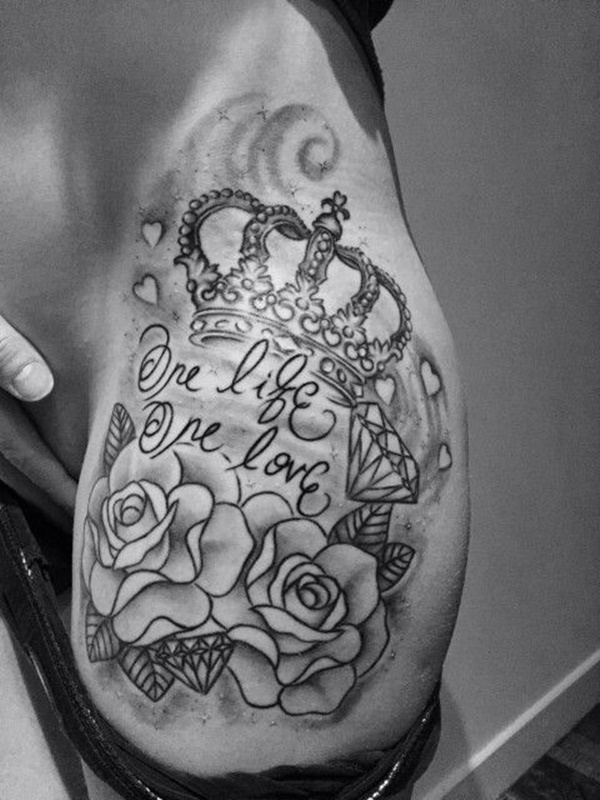 A crown is accented with roses, a diamond, and the quote, “One life one love,” in this bicep tattoo. 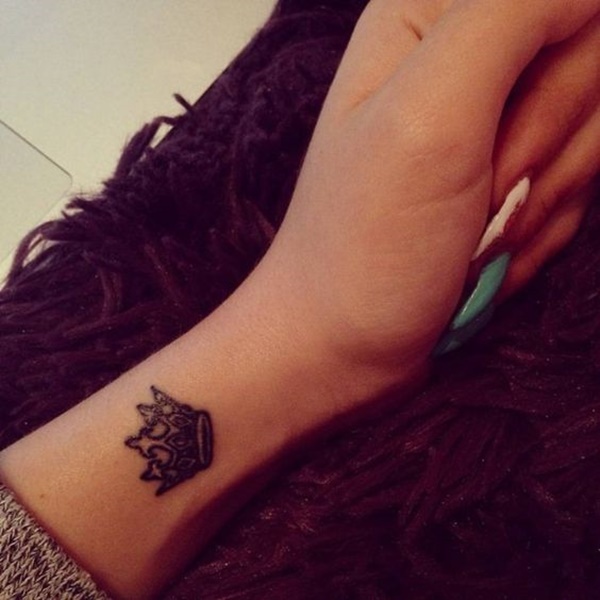 A black and gray crown adorns the wearer’s wrist. 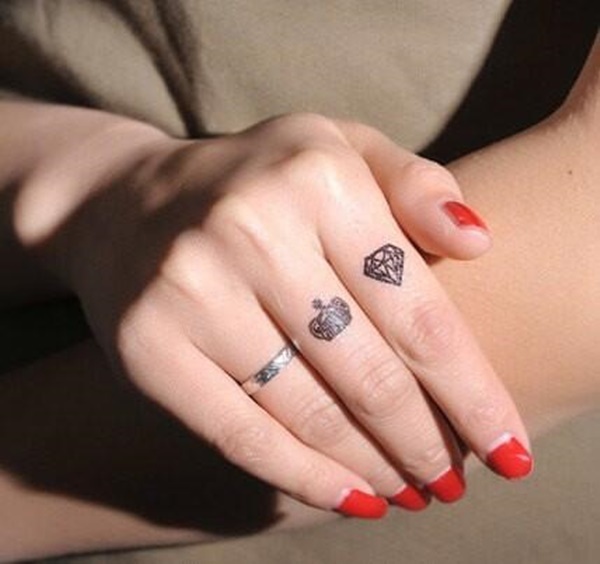 This tattoo set renders simplistic crowns on the wearers’ index fingers in black ink. 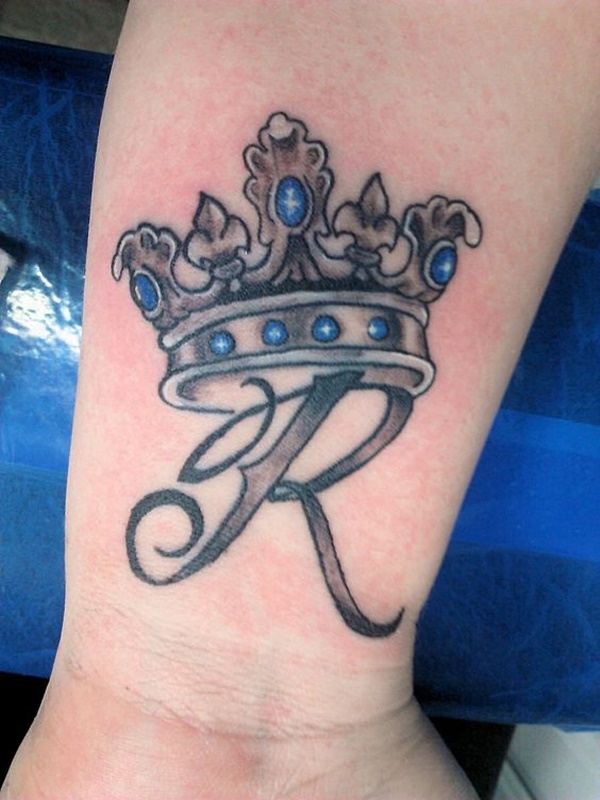 The letter R is topped with a crown embedded with blue jewels in this tattoo set. 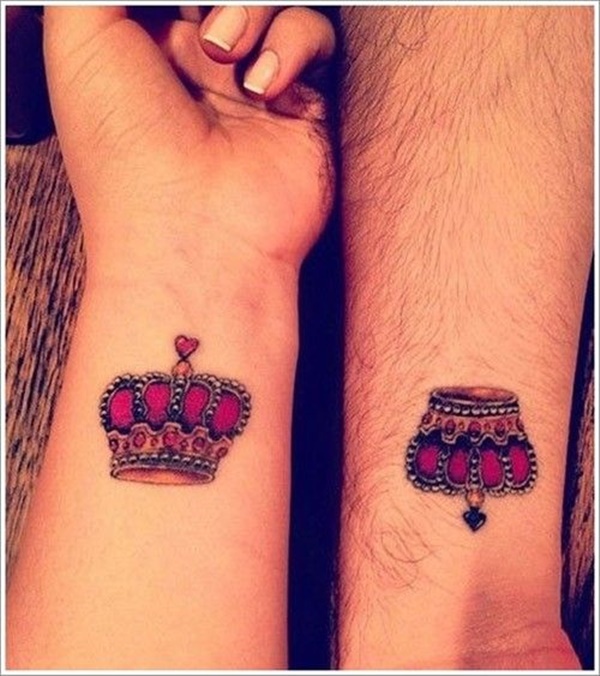 A set of king and queen crowns are portrayed with red embellishments on the wearers’ forearms. 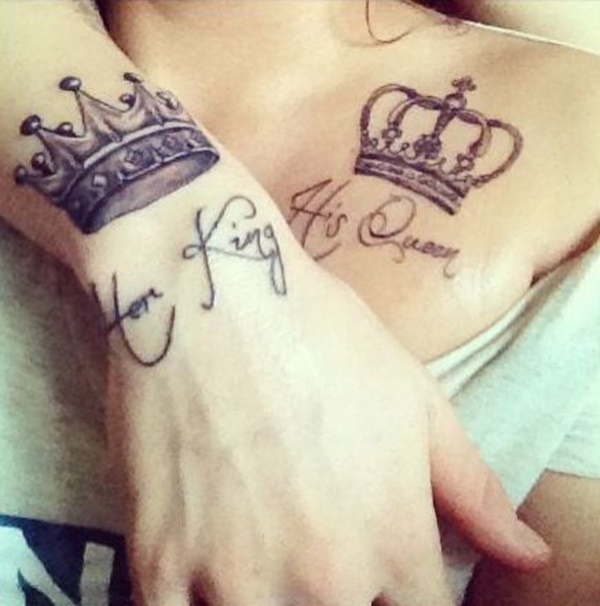 Here we see another king and queen crown set, this time with the quotes, “Her King,” and, “His Queen,” reading underneath the images. 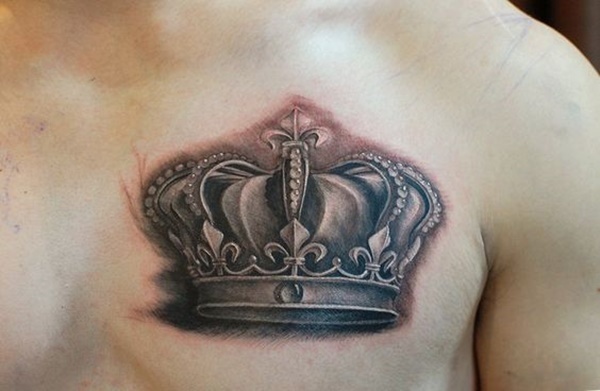 A simplistic rendition of a scrolled heart with a crown is portrayed on the wearer’s torso in black ink. 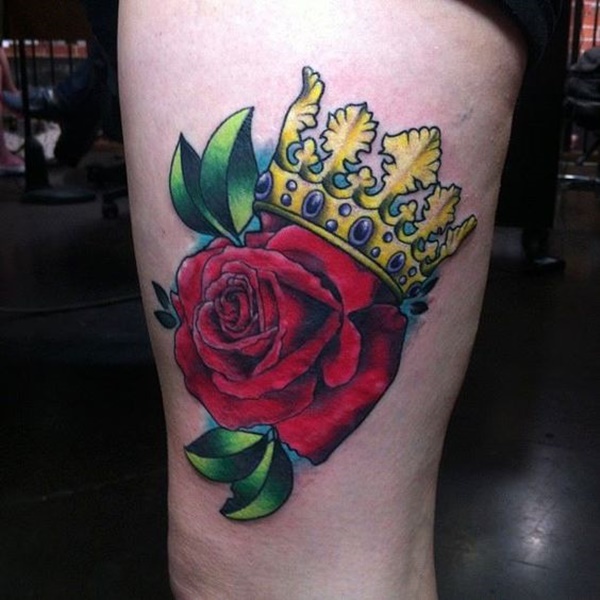 A vibrantly colored crown adorns the wearer’s forearm in this tattoo. 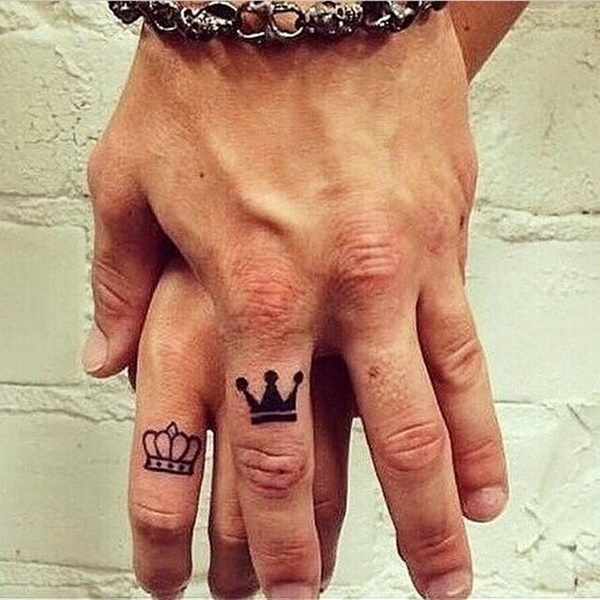 A simple black outline creates a crown on the wearer’s index finger. 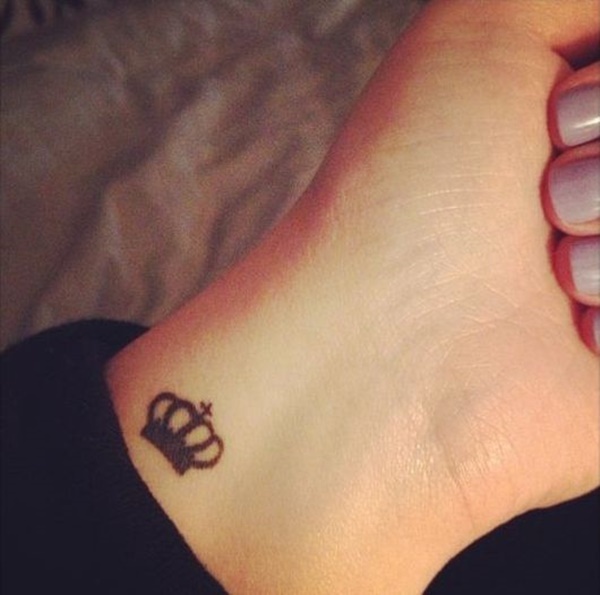 A black crown silhouette is illustrated on the wearer’s wrist. 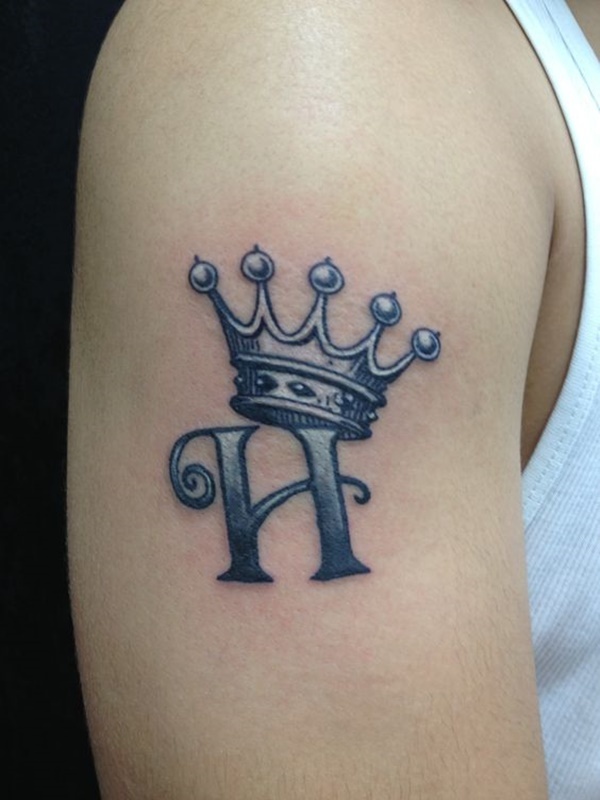 Black, gray, and white ink is used to portray the letter H with a crown atop the letter. A hyper-detailed portrait of a skull wearing a crown is rendered in black and gray ink in this tattoo. Another example of a black and gray crown on a wrist is seen here. Another example of simple crowns rendered on the wearers’ index fingers is seen here. 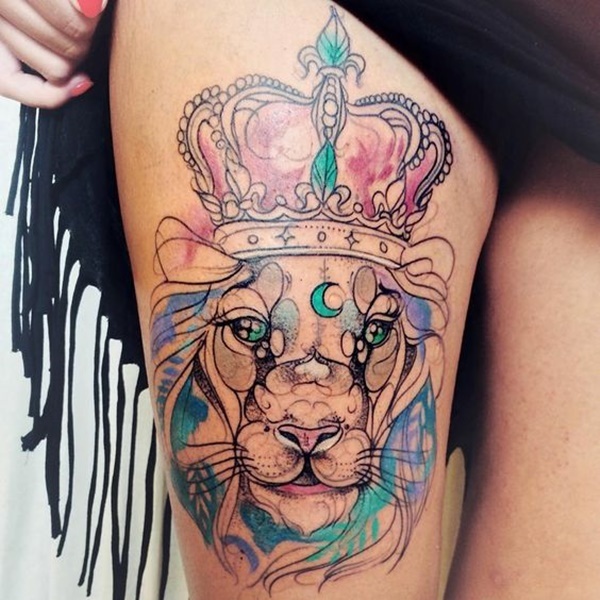 A crowned lion is colored with a palette of teal, blue, and purple in this tattoo. A crown topped with a cross is embellished with white pearls and red accents. 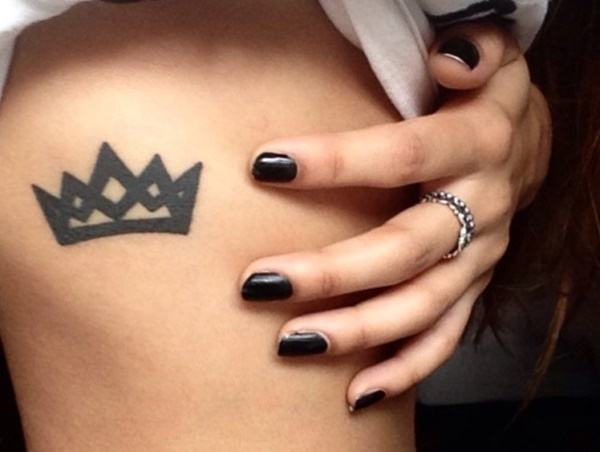 A crown is illustrated with the use of a bold black outline. 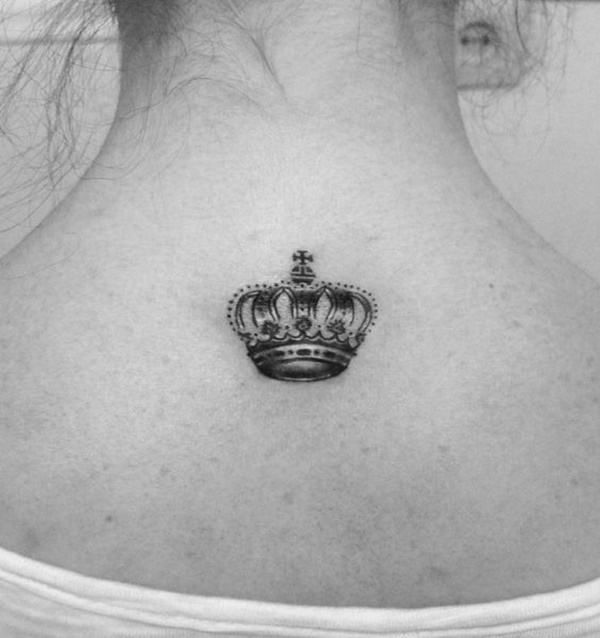 A crown, rendered in black, gray, and white, is inked between the wearer’s shoulder blades. 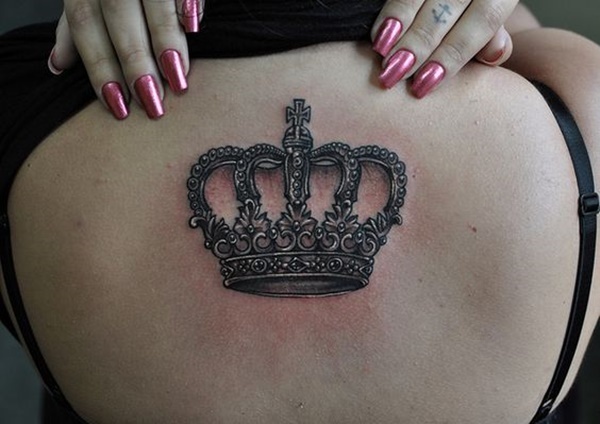 A blacked-out crown is portrayed on the wearer’s right hip. 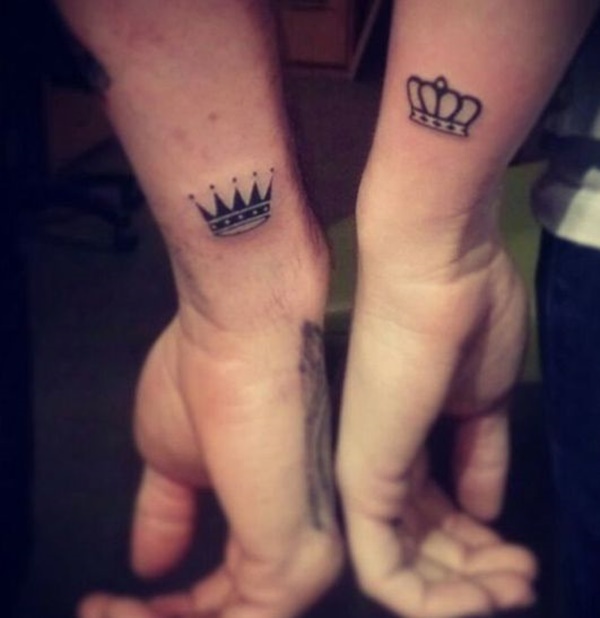 Another tattoo set of king and queen crowns is embellished with the wearers’ initials. A black and gray crown adorns the wearer’s right hip. A black, gray, and white crown set is seen on the wearers’ wrists. 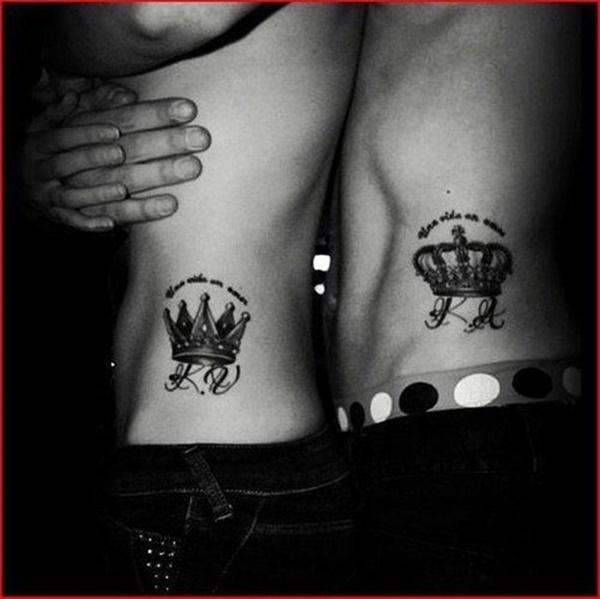 Another example of a king and queen crown set is rendered on the wearers’ torsos and the pieces are accented by a set of initials and a quote. 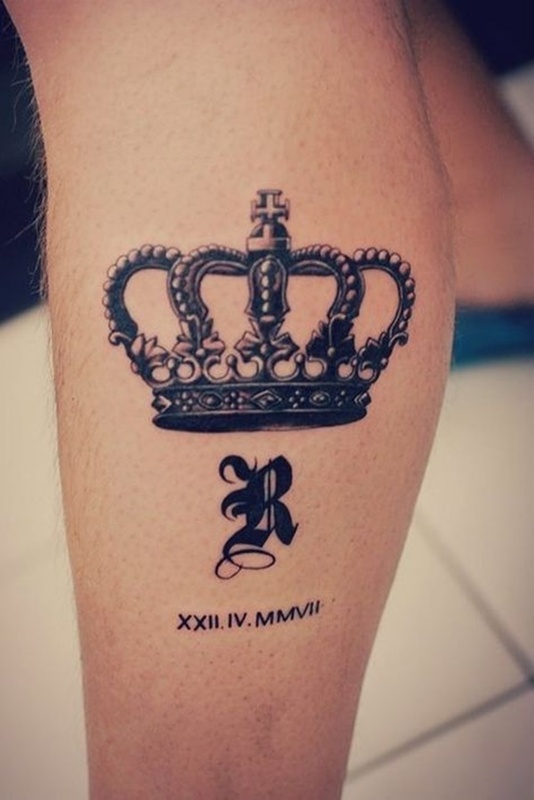 A crown sits above the letter R and a set of roman numerals representing a date in this black and gray tattoo. 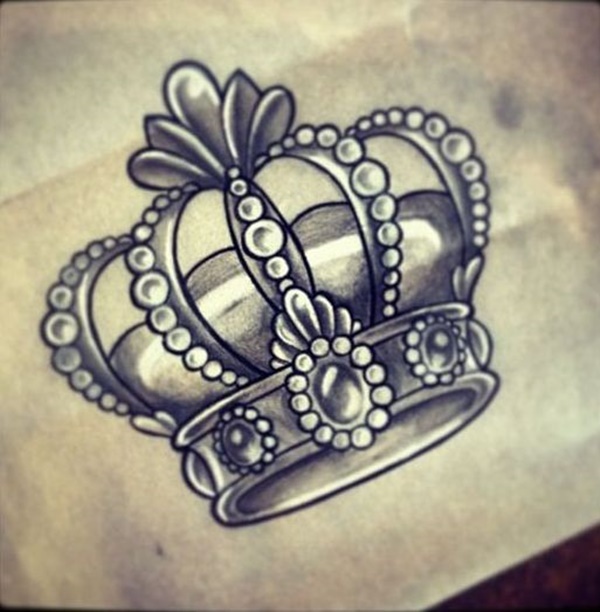 A stylized crown utilizes white ink to give the effect of glimmering metal and gemstones. 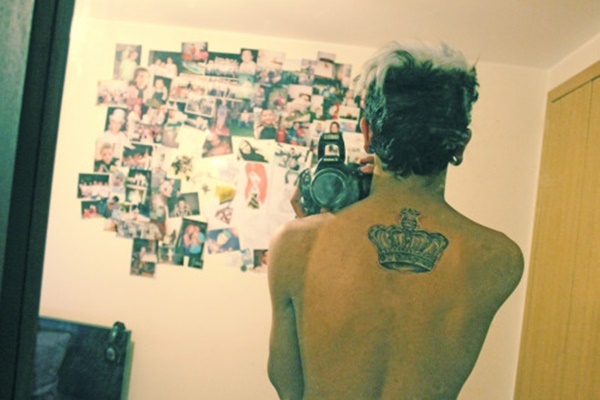 An ornate crown is inked between the wearer’s shoulder blades in this tattoo. 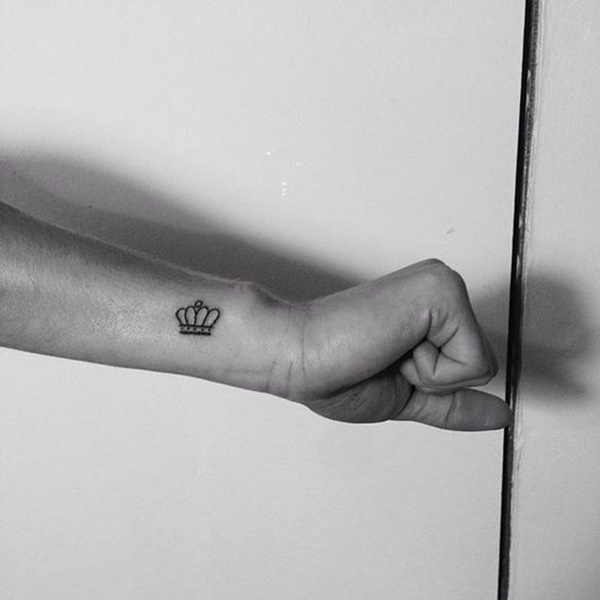 A hyper-simplified crown outline is rendered on the wearer’s wrist in black ink. 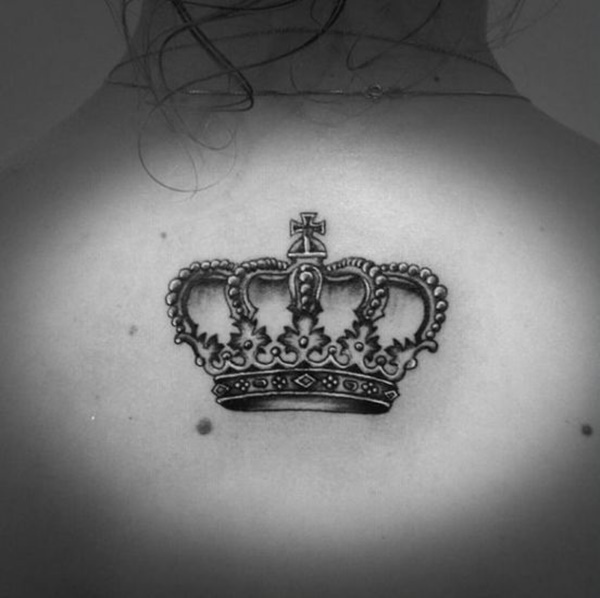 A blacked-out crown silhouette is portrayed between the wearer’s shoulder blades. A hyper-realistic black and gray crown is depicted with fleur de lis embellishments. 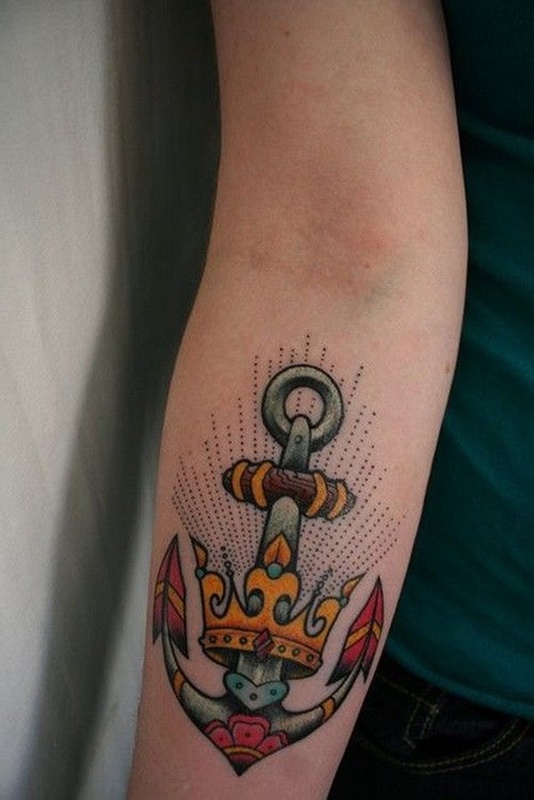 This tattoo, illustrated in a traditional style, shows a colorful anchor accented with a crown wrapped around the shank. 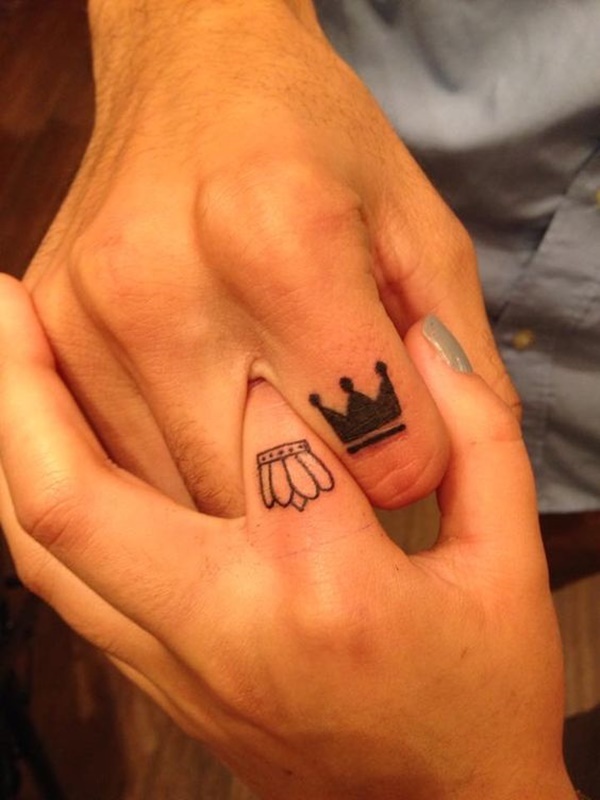 Another set of king and queen crowns is seen on the wearers’ hands. 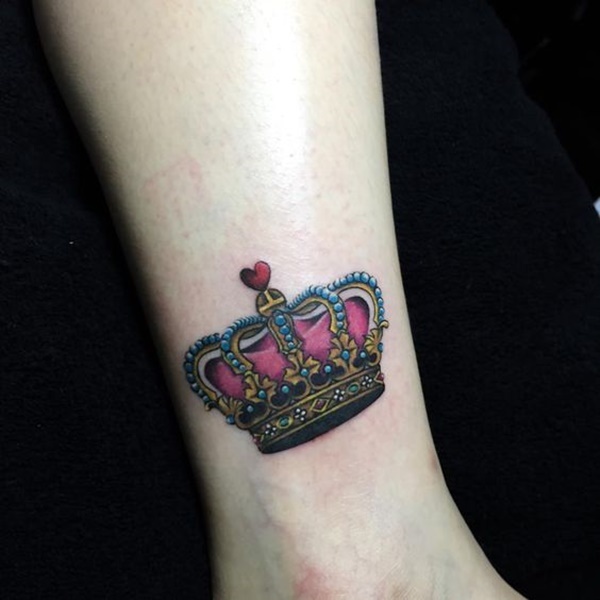 A feminine crown is laden with pink embellishments in this tattoo. 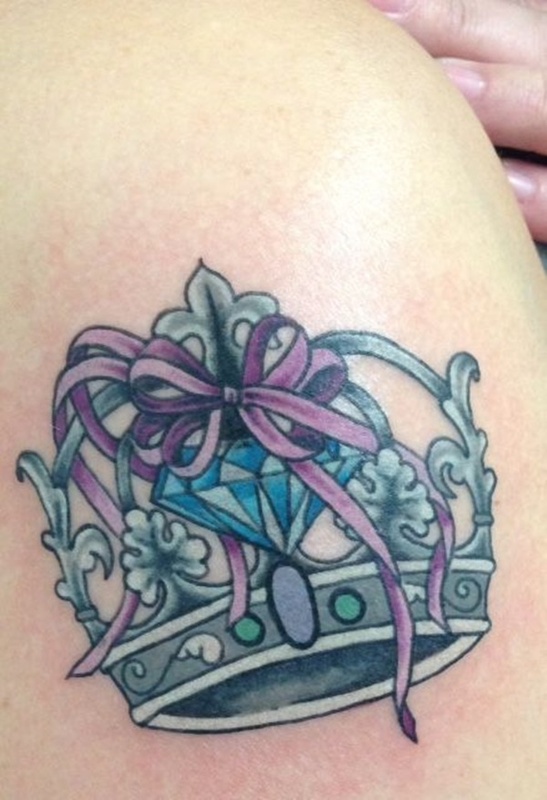 A black and gray crown is accented with pink gemstones and surrounded by pink diamonds in this tattoo. 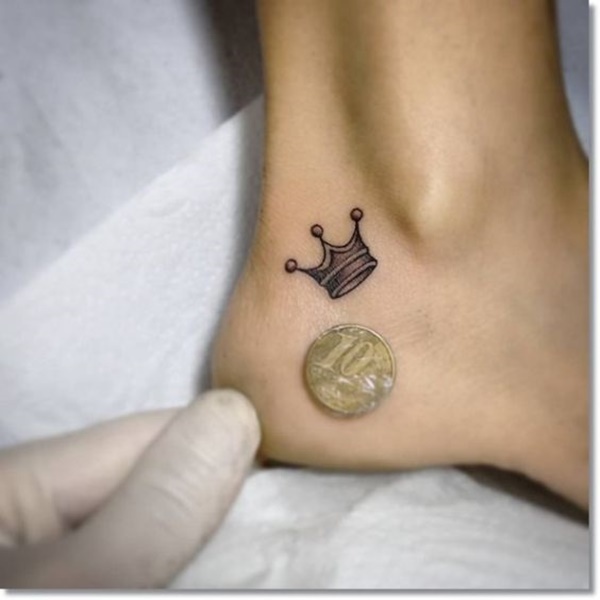 A small black and gray crown is illustrated in front of the wearer’s ankle in this piece. 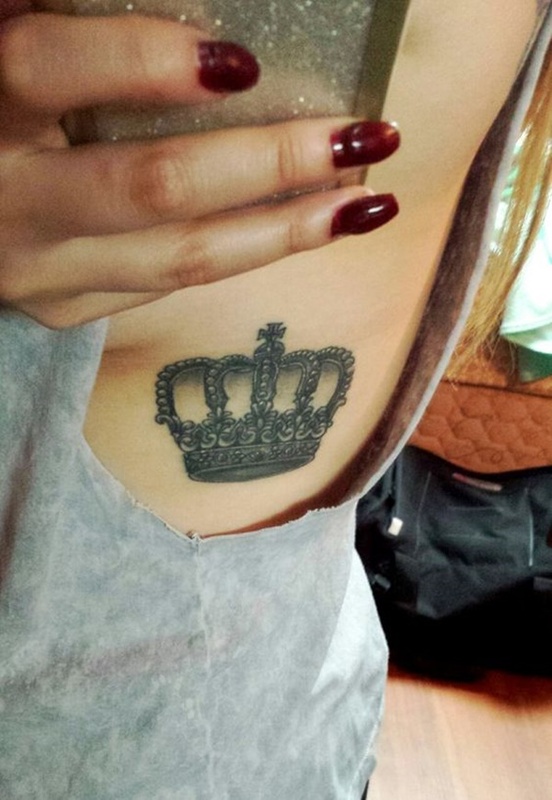 A small black crown adorns the left side of the wearer’s rib cage. 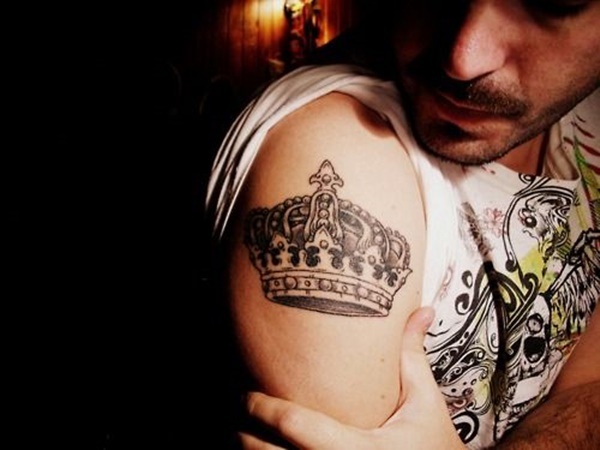 A crown is created using an elaborate, scrolling, black outline in this tattoo. 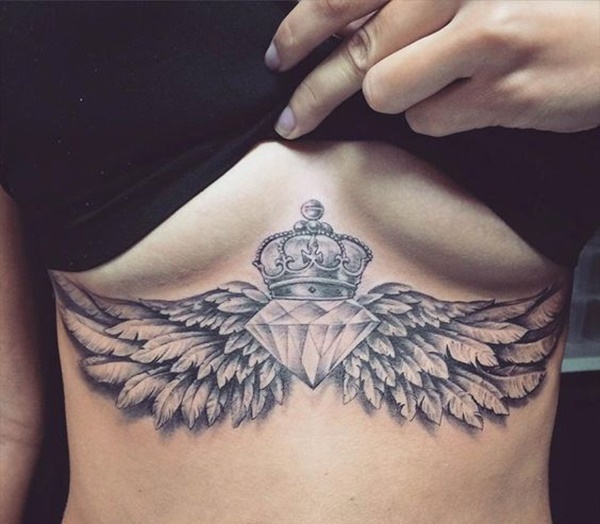 A diamond adorned with wings and a crown is inked between the wearer’s breasts in this black and gray tattoo. 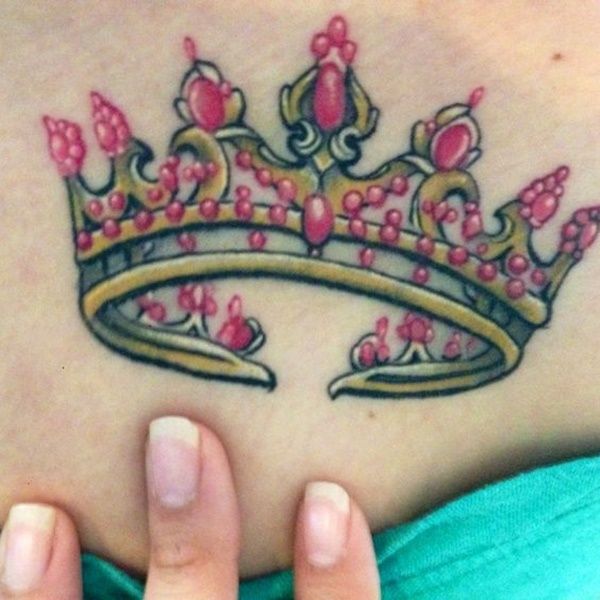 An ornate crown graces the left side of the wearer’s rib cage in this tattoo. 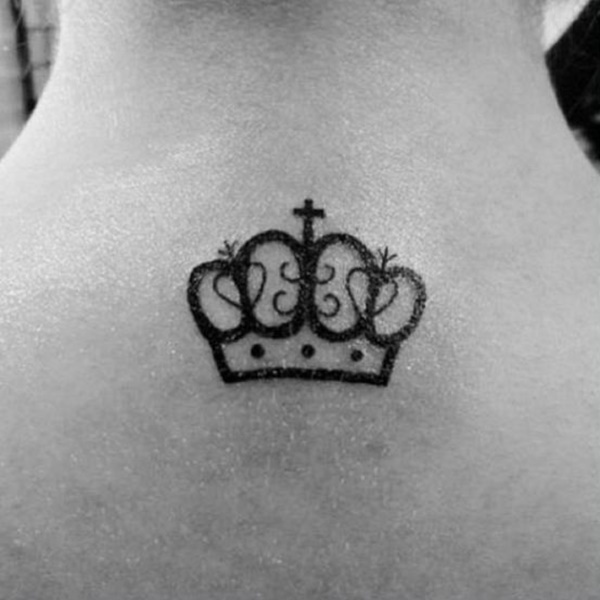 A black crown topped with fleur de lis embellishments is inked over the wearer’s left collarbone. 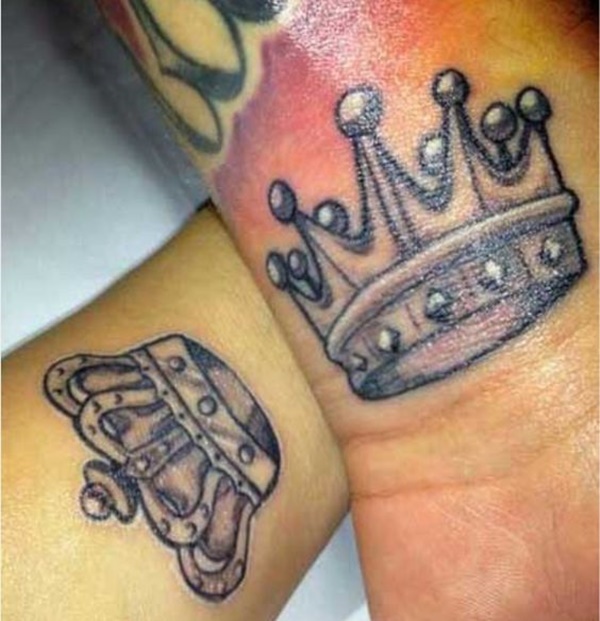 King and queen chess pieces are depicted on the wearers’ forearms in black and gray ink in this tattoo set. 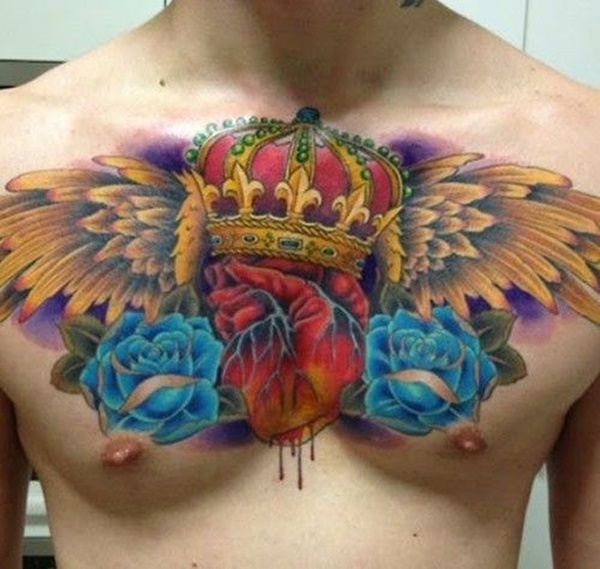 This tattoo, utilizing a diverse and vibrant color palette, portrays a crowned heart surrounded by wings and bright blue roses on the wearer’s chest. 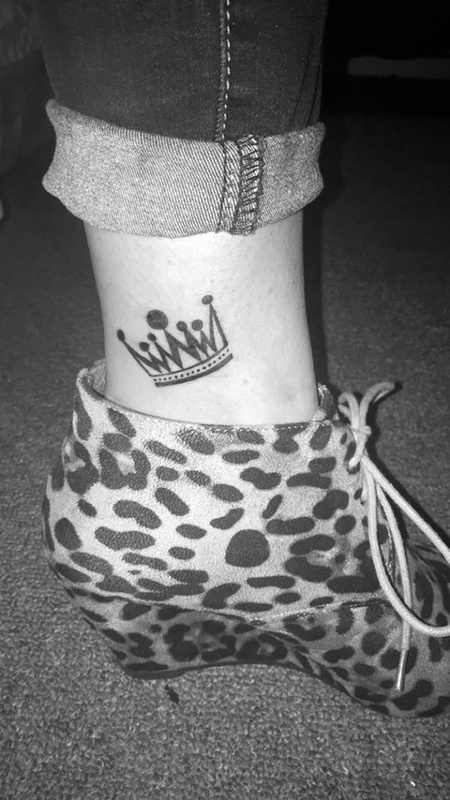 A bold black crown is inked just above the wearer’s ankle bone in this tattoo. The lifeless face of an owl is embellished with a hovering crown above the main image and a series of scroll embellishments at the base of the image. 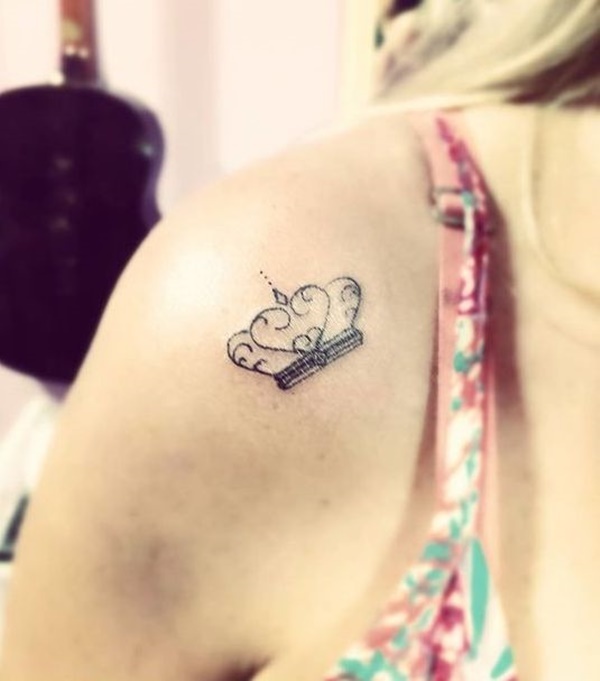 The piece is rendered in black and gray ink on the wearer’s forearm. A stylized black crown is portrayed at the base of the wearer’s neck. 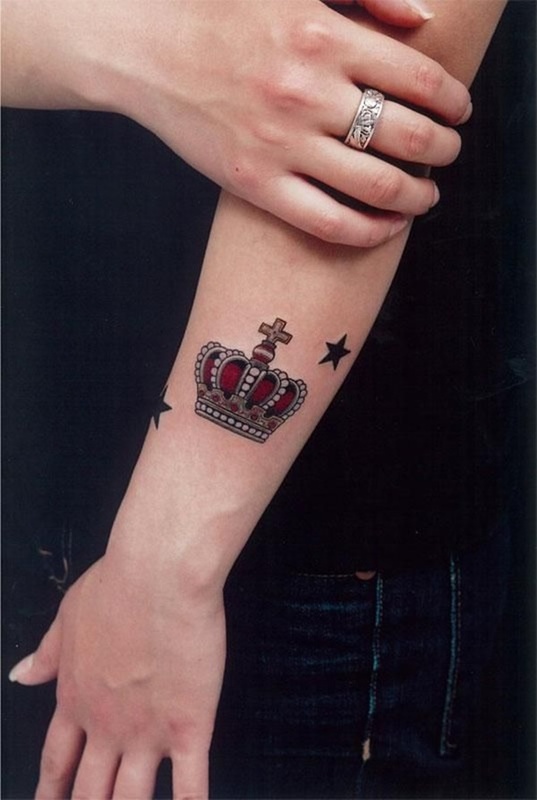 The simple design is embellished with a cross at the top of the crown and a series of thoughtfully placed dots around the main image. 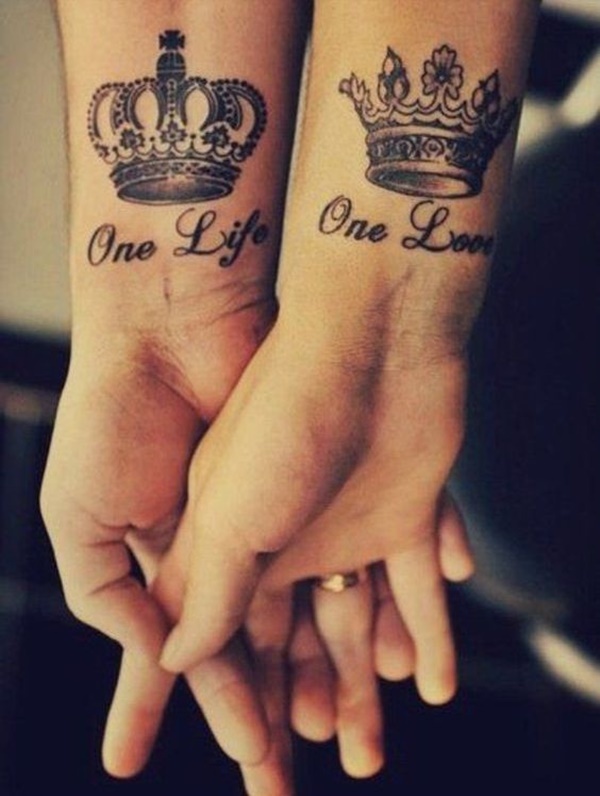 Another example of a king and queen tattoo set is seen on the wearers’ wrists in this tattoo set portrayed in black ink.